SSC CGL Tier 1 exam is scheduled to be held from 1st August to 20th August 2017. Registration has been closed by 19th June. Now, it’s time to get prepared for the exam. Around 30 lakh candidates have applied for SSC CGL 2017 vacancies. There will be a tight competition for which you need to be prepared well. You need to plan before you act! We are presenting here how to effectively prepare for SSC CGL Tier 1 in a month’s time. a. Read current affairs from newspapers and articles. Note down the important headlines and remember them. Try to cover important events from the Indian History (Medieval and Modern). Geography (Physical), Economics, Indian Constitution etc. b. Analyze some of the papers from previous years. You will get a brief idea of the important topics and you can focus on them. c. Make a list of all the important and frequently asked topics and practice them. d. Try to practice mock tests which will help you gain confidence and increase your accuracy. Week 2: In the second week, utilize a few days (2 to 4 days) to practice questions of “Reasoning Ability”. Try to focus on those topics which were frequently asked in the last few year papers. a. Try to practice questions from topics like Sitting Arrangement, Puzzle, Vein diagram etc. b. Practice questions from “reasoning” and “general intelligence” topics. These topics consume more time and you can speed up your performance by sincere practice. c. Try model test papers and mock tests to analyze your performance and check your improvement. Week 3: Since its the third week, its time for “Quant”. a. Try to focus on topics like Data Interpretation and Trigonometry. b. Practice quant questions from previous year papers. c. Try to avoid topics that are not covered in the past year papers. d. Try to solve questions using tricks and shortcuts. This will save your time and enable you to attempt maximum questions. Week 4: In the last week, practice questions from the “English Language section”. a. Try to focus on the practice of reading comprehension questions and sentence formation/ improvement. b. Concentrate on topics like One word substitution, Analogy, Antonym and Synonym. c. Make a note of all the difficult words you come across along with their meanings. 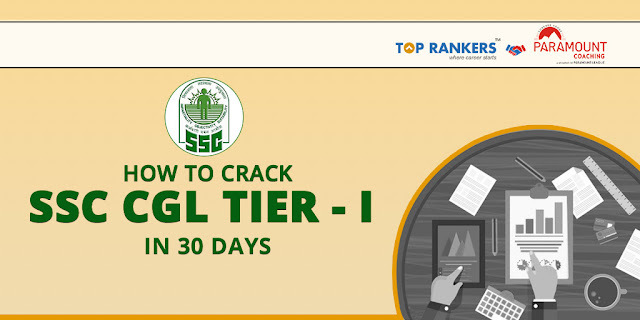 You need to practice from the best mock test series for SSC CGL 2017. TopRankers is an online platform where you can get Paramount SSC Mock Tests which is best source to prepare for SSC CGL examination. TopRankers offer you an unmatched user experience, in-depth analysis, reporting system & feedback mechanism to help you prepare well in the exam. Disclaimer : This is an Sponsored Article and may not be the personal views of QMATHS.